UPDATED: Thu., March 7, 2019, 10:14 p.m.
OLYMPIA – Washington gun dealers will be required to conduct enhanced background checks when selling semi-automatic rifles starting July 1, even if they disagree with the initiative that passed last fall, Gov. 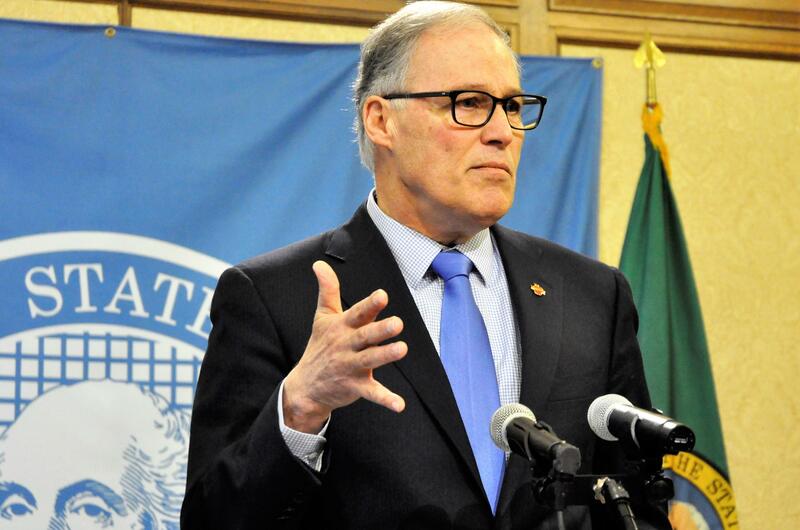 Jay Inslee and Attorney General Bob Ferguson warned Thursday. Dealers already are barred from selling semi-automatic rifles to anyone under 21, they added. Violating either law could cost them their licenses. In a letter to the state’s gun dealers, Inslee and Ferguson said gun dealers shouldn’t be swayed by the comments of some county sheriffs who say they won’t enforce the law because they think it’s unconstitutional. The letter is an attempt to clear up any confusion about the law, Inslee said at a news conference Thursday morning. The sheriffs have a right to disagree with the law and voice those opinions, he said. “They do not have a right to think they are mini-Supreme Courts,” he said. If they want the law overturned, they should challenge it in court, he added, but so far there has been no court ruling against it. The letter to dealers, which follows letters to county sheriffs about the need to follow the law, tells dealers they could lose their license and face state or federal criminal charges if they break the law regarding the new age limit or fail to do the enhanced background checks starting in July. Initiative 1639, which puts new restrictions on the sale of all semi-automatic rifles and new requirements for the safe storage of firearms in homes, passed in November with 59 percent of the vote. Frank Perry, who owns the Protection First gun store at 1403 N. Greene St. in Spokane, said he’ll abide by the law barring sales to those under 21 unless a court strikes down the law. But he agrees with Inslee that the proper way to challenge it is in court. For law enforcement, the law is essentially administrative, he added, involving background checks for semi-automatic rifles that are currently conducted for handguns. “We’ve always done background checks,” Knezovich said. Although state law requires Ferguson to defend the initiative, some sheriffs in some other counties have suggested opponents of the new law file affidavits of citizens complaints for criminal proceedings against the attorney general. The group Washington Strikes Back 1639 provides affidavits for opponents to print out, fill in the blanks and file. Knezovich said he doesn’t support that effort, but has had affidavits sent to his office. He delivered a envelope full of the documents to Spokane County Prosecutor Larry Haskell this week. He didn’t count them, but estimated there were between 20 and 50 affidavits with supporting papers. Haskell assigned them to a senior deputy to review, to determine whether they comply with court rules for such complaints, before deciding what to do with them, he said. There’s more than 300 pages in the stack, and it’s premature to say what could happen next until they’ve been studied, he said. “We have a long way to go,” Haskell said. Published: March 7, 2019, 12:03 p.m. Updated: March 7, 2019, 10:14 p.m.